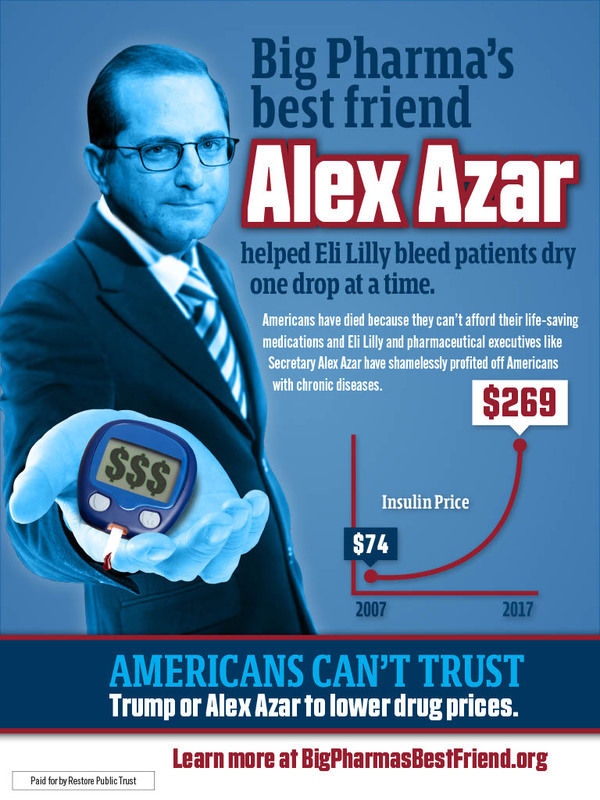 The ad illustrates how insulin prices more than tripled under Azar’s tenure at Eli Lilly and encourages readers to visit BigPharmasBestFriend.org for more information about Azar’s big pharma past. BigPharmasBestFriend.org features an ad that highlights Azar’s history as a pharmaceutical insider and a report about Azar’s tenure at Eli Lilly, when drug prices – including insulin prices – skyrocketed. Today’s hearing is the second in a two-part series that the Subcommittee is holding on rising insulin prices. In last week’s hearing, Representative Nanette Barragán brought up Azar’s ties to Eli Lilly and pressed the administration on its hypocrisy on drug prices given Azar’s big pharma background. Yesterday, Restore Public Trust launched its drug pricing horror stories digital campaign, which featured stories of Americans who were forced to pay too much for their medications and questioned why Azar hasn’t done more to lower drug costs.